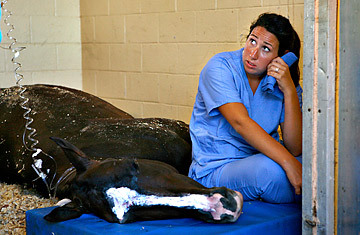 Palm Beach Equine Clinic Veterinary Technician Ginny Powell appears worried as she tries to save a dying horse. Where Can You Play Elephant Polo? Polo fans say few things are as inspiring as watching eight majestic thoroughbred horses maneuver over a 300-yard-long field. But as anyone who was at the U.S. Open polo tournament in Wellington, Fla., last Sunday has attested, few things are as shocking as seeing those same horses stagger and drop dead. Twenty-one polo ponies belonging to the Lechuza Caracas team from Venezuela died either before, during or after Lechuza's Sunday afternoon match. Franck's, an Ocala, Fla., pharmacy, admitted in a statement Thursday that it had incorrectly mixed a medication administered to the Lechuza horses before the Sunday match. The pharmacy, citing the ongoing state investigation, would not specify what medication. But a knowledgeable source close to Lechuza tells TIME it was Biodyl, or at least a copy of it made from the same components of the vitamin. One Wellington horse veterinarian also told TIME that Biodyl, or "a compound a little off-label," is widely used in the U.S. "You don't know how many times Franck's has compounded this and never had a problem," says the vet. But he predicted its use would drop off sharply now. State investigators have yet to comment. But whatever the cause, the tragedy has thrust Lechuza's obscure but powerful owner, multi-millionaire Venezuelan banker and polo fanatic Victor Vargas, into the spotlight he usually avoids. In fact, since the beginning of the week, Vargas has not been seen at the Palm Beach Polo Club in Wellington; newspaper reports in the Palm Beach Post and other South Florida media say he's either holed up in the $70 million Palm Beach mansion he purchased last year  one of six homes he owns in Venezuela, the Caribbean, the U.S. and Europe  or has flown overseas in one of his luxury Gulfstream jets. Critics say Vargas made a backroom deal with Chávez's government to handle some of the revolution's murkier financial transactions, such as more than $1 billion in Argentine bond swaps, or the handling of hard currency between Venezuela's official exchange rate of about 2.15 bolivares to the U.S. dollar and the quasi-legal black-market rate of almost six to the dollar. Vargas has long denied the accusation, insisting he's not part of the "boli-bourgeoisie" (named for Chávez's Bolivarian Revolution) that got rich cozying up to Chávez while oil prices skyrocketed in recent years. He and his friends say instead that he's simply a banker Chávez officials have found trustworthy, a man who can deal in capitalist circles but who funds three foundations for the poor and deep down sympathizes with the revolution's social agenda. Perhaps, but Vargas' lifestyle is hardly the stuff of Chávez's "21st-century socialism." In a rare interview last year, he told the Wall Street Journal, "People write stories about me saying I have a Ferrari, a plane, a yacht. But it's not true. I've got three planes, two yachts, six houses. I've been rich all my life!" In 2004, his daughter Margarita wed Luis Alfonso de Borbón, a cousin of Spain's King Juan Carlos, great-grandson of the late Spanish dictator Francisco Franco and a legitimate heir to the non-existent throne of France. They were married at Vargas' palatial mansion in the Dominican Republic, a wedding that was catered by New York's exclusive Le Cirque restaurant and included 1,000 guests. But although Vargas enjoys conspicuous wealth in the U.S., his banking career in the country has met obstacles. In 1993 he paid the Federal Reserve Bank of New York $1.5 million in fines after it determined Vargas had lied about his knowledge of fraud that executives had committed at a bank he was in the process of acquiring. (As part of his settlement with the Reserve Bank, he didn't have to admit guilt.) Today, Vargas cannot invest in U.S. banks without government permission. Still, the incident doesn't seem to have put much of a dent in his personal worth (which he declines to divulge). The high cost of caring for horses has sometimes led some owners to abandon their animals, to sell them to slaughterhouses or to attempts at fraud in order to collect insurance. But polo is a rich man's sport and Vargas certainly does not seem to have been hurting from the care and feeding of his steeds  or skimping on providing for them. His Lechuza Caracas polo team plays around the world, and he transports his stable of 60 ponies  estimated to cost about $100,000 each  on special jets. So what killed the animals? Nero, in the La Nación interview, insisted that Lechuza would never inject performance-enhancing steroids or other similar substances into the team's horses, not only because those substances are banned in polo-playing countries like Britain, but because "we live with them. If there's anyone who never wants to see their horses killed, it's us." Meanwhile, whether or not the horses died from being injected with anything illicit, polo figures like Neil Hirsch, owner of Black Watch, one of the U.S.'s best teams, are calling now for the U.S to get more serious about anti-doping rules in equestrian sports.